What an incredible race experience!!! 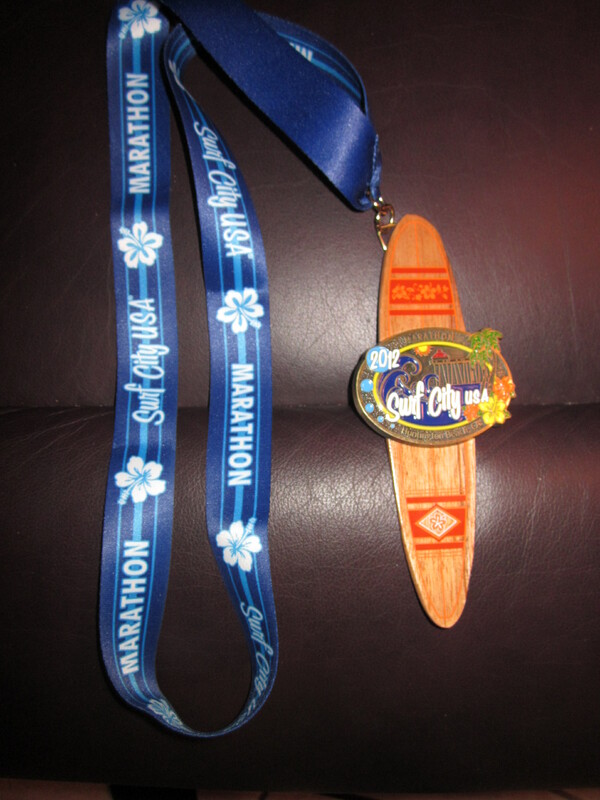 Everything about the Surf City Marathon was really awesome, from the cool expo, the awesome finisher’s medal (it’s a surf board! ), seeing my family and friends, running on a course that I’ve driven or ran on hundreds of times, and most importantly, reaching my goal of a sub 3:50 marathon and achieving a 12.5 minute PR! Race Day Eve Breakfast Feast! The day before the race was a great day! Mike, Asia and I went for a 2 mile run in the morning (after getting a solid 9 hours sleep!) which included a couple of 30 second pick-ups to keep our lungs fresh. After the run we stretched and foam rolled and then Mike and I headed to brunch at one of our favorite restaurants. 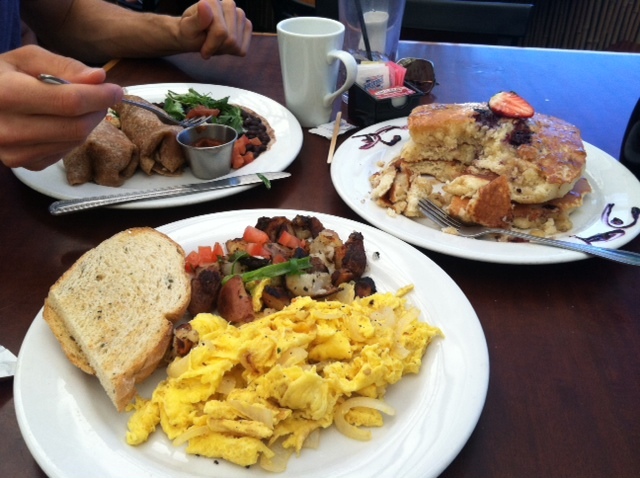 We each ordered an entree PLUS an order of banana-blackberry pancakes to share! YUM! I probably only ate about half my breakfast and 1/3 of the pancakes but I was glad to have some protein and salt with my sugary carbs! Our luck started off early on Saturday when we arrived at the expo and scored a sweet parking spot on Pacific Coast Highway right in front of the expo. 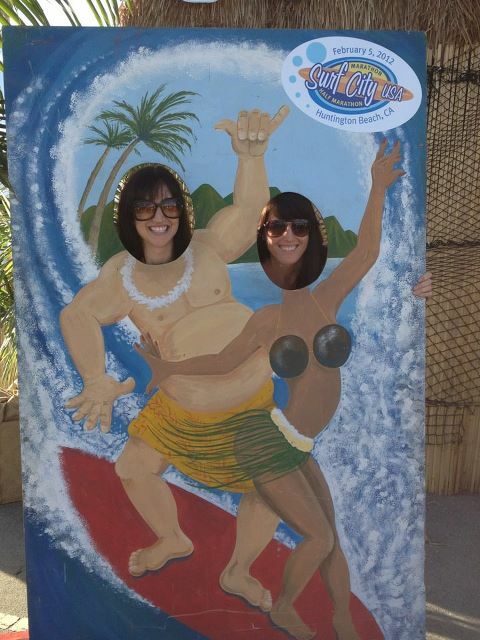 The Expo was a bit crowded but it was well organized in terms of checking in and had some fun interactive surf-themed photo-ops. The long sleeve dry fit shirts they gave us were awesome and we also got really cool reusable shopping bags to store them in! Asia, Mike and I were running this race but Jeremy (Asia’s boyfriend and a fellow member of our Ironman training team – Team WODS) came to support us. After we explored the expo for a bit we drove the course (what we could of it since a little less than half of it was either in a park or on the boardwalk). We all agreed it didn’t seem as intimidating as the San Diego Rock n Roll marathon since the start and finish were in the same place. Running one way makes it really seem like a long way to run (which is also very cool!). We met up with my mom for dinner that night at Macaroni Grill and filled up on a lot of rosemary focaccia bread and pasta and took advantage of the crayons and white paper table cloths. After dinner we went back to the hotel, full of nerves. Asia and I were especially nervous since we had told so many people (and I had blogged about it) that we intended to break 3:50. The last time we set out a big goal for ourselves, we weren’t successful (AFC half a couple years ago when we wanted to break 2 hours). We tried to pump ourselves up by saying that it had been 7 months since the last marathon and that our biking definitely increased our fitness, but I went to bed nervous nonetheless, hoping that the predicted 73 and sunny weather wouldn’t show up until after we finished. 4:15 wake-up call after a fitful night of sleep. Ah, race day. Unlike the last marathon, I only ate 1 piece of toast with peanut butter and a half banana (last time I ate that PLUS a full peanut-butter banana sandwich en route and then was super full during the race). We got coffee on the way to the race. Since there were only 2,000 marathoners and the marathon started 1 hr 15 min earlier than the half marathon (18,000 half marathoners! ), traffic wasn’t bad. 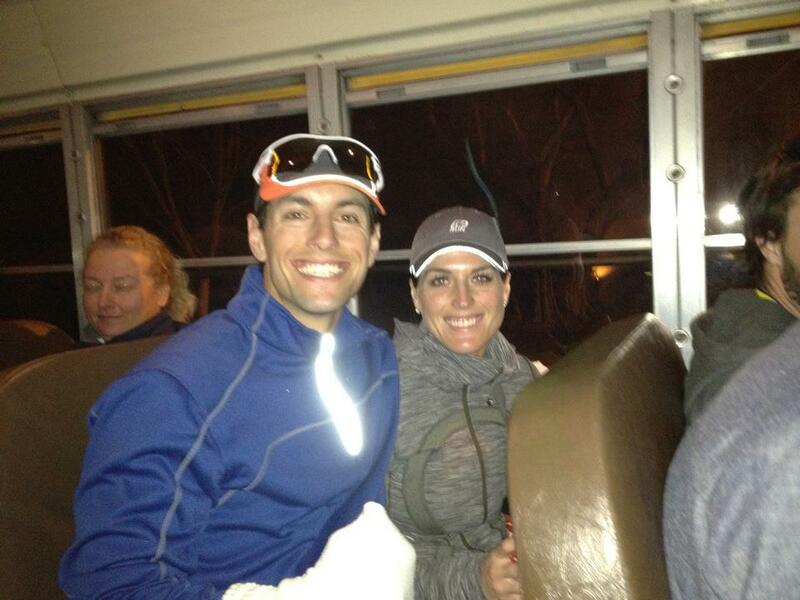 We parked at a lot a few blocks away and took a nice warm bus to the start. After two bathroom stops (with no line at one and a short line at the other – woohoo! ), we made our way to the start. The sun was finally coming up a bit at this point and it was probably just under 50 degrees. Somehow, I already had to pee again but I figured it was race nerves and ignored it since I didn’t have time to go. That was a mistake because I had to go for nearly the entire race! Luckily it didn’t get too bad so I didn’t have to stop. Asia also had to go the whole time! As soon as we got to our corral (3:50 estimated time was the start of the 2nd corral), we looked for our pacer. We found 3:45. 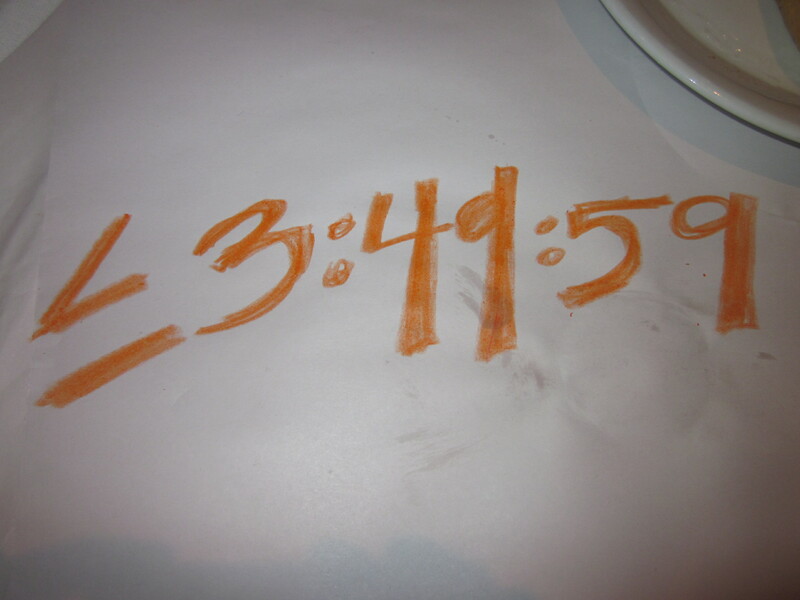 We found 3:55. Where was 3:50? He must have slept in. Thanks for all of your advice, I had already anticipating NOT relying on the pacer, but it was still disappointing to find that he/she just didn’t show up! I had my Garmin set to show my average overall pace and NOT to show me my mile splits and Asia had hers set to show us our mile splits. This method worked really well. We started off the race at a nice pace and it felt really good to be running 8:44-5/minute miles. We were very consistent in our pace and it wasn’t a problem to maintain. We made our way down the coast and then turned inland and then made our way through Central Park. This was one of my favorite parts of the race. Central Park covers two city blocks and I’ve been to it probably a hundred times in my life so it was pretty awesome to run through it. The sun was rising and the lake looked beautiful and the trees kept the path cool. We ran on a path as well as a trail during this part and there were a lot of turns. We kept up our pace and naturally found ourselves running with the same people. By the time we made it out of the parks, we hit our first and only steep hill, at mile 8. I clicked my watch to the heart rate setting and told Asia I didn’t want it to go over 180 (it was creeping between 170-175 the whole time which is pretty normal for me). It did climb to 182 unfortunately but it was a short hill so I don’t think it made a big difference (as I learned during my VO2Max test, any time your heart rate climbs over zone 3 you really start to burn carbs and have a higher chance of bonking/hitting the wall). Soon after the hill we saw my dad and step mom, who were taking lots of pictures and waving wildly to us. It was great to see familiar faces! Throughout the race Asia and I were checking in with each other on how we felt and during these first 9-10 miles we both agreed that we felt fantastic. Although our pace was 30-45 seconds/mile faster than our long runs, we both felt better than our long runs. It’s really incredible what a good taper and a week of quality sleep can do for you (not to mention race nerves, caffeine, and adrenaline!). As soon as we turned onto the coast and started making our way north on PCH, we saw Jeremy and he cheered us on. We still felt really good and were feeling really positive about meeting our goal. I brought some electrolyte tablets with me which I experimented with during 2 of our long runs and felt safe taking, despite not using them consistently in training, and I took 2 around mile 10. It was starting to get really warm at this point. It wasn’t until we made our wall all the way down the coast and turned around that we hit 13.1 – halfway home and feeling great! Although there were less bands and less spectators on this course than Rock n Roll marathon, I did enjoy the crowds and music provided. Many of the volunteers were children who were very excited to be helping us out. There were some good signs around the 14 mile marker, one of which said “Don’t stop (That’s what she said)” and some other clever ones. Around this time is when I felt the first signs of fatigue, mostly in my glutes, which is typically where I get sore first. However, our pace was still on track. This section of the race seemed to last a while and we kept hoping to finally reach the turnaround where we’d get onto the boardwalk for the final 10 miles or so. On the way there, we saw my dad and step mom again and then Jeremy a couple miles later. We also saw Mike running at head of us a couple of times. It was great to see them! Once we got to the turnaround, I was starting to feel it a bit. There was a fairly strong headwind and I stated to question my ability to keep the pace up. Around this point I reminded myself how lucky I was to be racing this race. One of my closest friends recently lost her brother to a very random accident. At the time I was running, I knew he was in critical condition but not that he had passed and I just focused my energy on him. I was thankful for my own life and praying for his. I told myself to remember that no matter how much it hurt, I was lucky to be healthy and racing. On the way up the coast we spotted our support team again – first Jeremy and then my parents. At this point our 8:43-5 pace was getting harder to keep. My watch told me we were still at a total average of 8:45 min/miles but I knew we needed to pick it up unless we wanted it to be really close. Asia’s watch told us we did a couple of miles in the low 8:50s despite feeling that we were picking up the pace. We knew we had to push harder to get there. I was doing everything right – I was taking my Gus at 37-40 min intervals, I took 2 more electrolyte pills, and I was drinking plenty of water. I was pouring water over my head and down my back to keep cool (this turned out to be a double edged sword as it ended up running down my pants and giving me some chaffing issues that luckily I didn’t feel til after the race). Although I wasn’t feeling as good as I felt in the beginning of the race, I still felt better than at this point during the last race. I kept that thought in my head and told myself that as soon as we reached the turnaround that it would be go time. I told Asia when we had 1 hour 15 min to go that we “only” had 1 hr 15 min left in the “pain cave” and that we could do it! She later told me that this comment wasn’t helpful (hah!). At the turnaround, my mom was there to cheer us on. I was happy to see her! As soon as we turned around, we had the wind at our backs. Unfortunately it didn’t feel all that much easier! We ran the next couple of miles at 8:50 and Asia urged us to pick up the pace. I was glad to have her with me! We picked it up and started passing even more people (we passed people pretty consistently for the last 10 miles of the race). I was feeling bad but I don’t think I hit “the wall” at any point. I took my last Gu nearly 10 minutes early but I knew that I would need it to push through the last few miles. Although I don’t think we hit a “wall” since we didn’t just totally blow up, running got much harder. The pace was hard to maintain and I didn’t feel great. However, some sheer determination got me to that finish line. I used my mantra “pain is temporary, pride is forever,” I thought about how great it would feel to achieve one of my 2012 goals early in the year, and I thought about all the work I put in to training, including those painful Yasso 800s! We saw my parents for the last time and shortly after I felt a twinge of a cramp in my left foot. Minutes later, I felt another cramp, this time in my right foot. I got a little worried but tried to ignore it. With less than 2 miles to go, Jeremy joined us to run to the finish. We both were in the zone and not really responding to his supportive talk. He told us that we were going to achieve our goal and not to worry. I checked my watch and believed it was possible, especially since just a few miles back we had only been about .01 behind the actual mile markers (in long races, it is very common for runners to run .05 to up to .3 or more extra miles than the total course due to weaving and not taking corners perfectly). Asia pulled away from me shortly after Jeremy joined us- we had picked up the pace to 8:15 or so at this point. However, the cramping was back and now my right foot was numb. A small panic came over me since I had read that that runnes sometimes suffer a stroke during marathons and usually one side of their body goes numb (yes I’m paranoid!). Jeremy could see I was struggling a bit and stayed back with me and was giving me words of encouragement. He told me to catch Asia and to not let her get away! However, my numb foot was freaking me out so I shook my head and just kept running at about 8:30 pace, knowing I’d still make my goal, with or without Asia at my side. Jeremy was a lifesaver and really boosted me up. Despite my lack of response, he kept shouting encouraging words and once my foot was no longer numb, I picked it up. I gave it all I could and pushed to the finish, nearly catching Asia and finishing in 3:49:36, just 5 seconds behind her. As soon as I stopped running, the fatigue of 26.2 miles of pounding set in. Unlike the Rock n Roll Marathon, we ran through each and every aid station and didn’t walk a step of this marathon. After spending nearly 3 hours and 50 minutes in the same motion, it wasn’t easy to walk, despite the fact that by nature it is supposed to be easier than running (which scares me for the Ironman – knowing that I can walk during the marathon helps make the race seem less scary but if it’s this painful it won’t be helpful at all!). 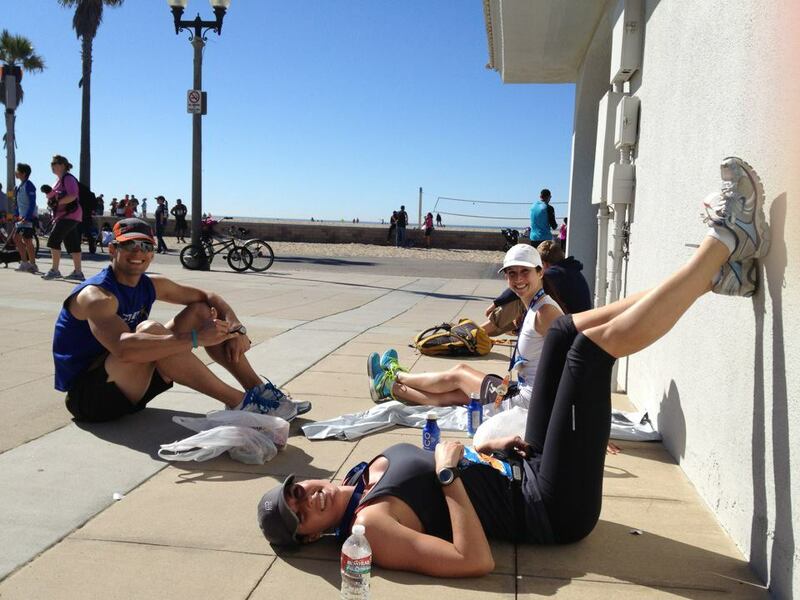 After grabbing all the post-race nutrition, we made our way to a wall where we could lay and elevate our legs. This greatly decreased my pain! The warm sun felt amazing – it was a gorgeous day and I was happy for the warm weather. Then we headed to the expo where I purchased a pair of compression socks and put them on as soon as I got to the car. Next we headed to lunch with my Dad, step-mom, and my childhood best friend (friends since we were 5!) and her husband. It was nice to recap the race and catch up with my family and friends. I really couldn’t have asked for a better day! I was so happy to have achieved my goal, even if by just a few seconds! I love setting goals and working hard to achieve them. It is probably my favorite part about racing. The best part about this great improvement in my time is that it gave me the confidence that if I work for it, I can get a Boston qualifying time. I am definitely going to stick with Yasso’s 800s for my interval training! In this case, Bart Yasso was right – I did 10 x 800 at 3:50 mins and ran just under a 3:50 marathon! Although I’ll be busy in 2012 with the Ironman, you’ll definitely see a BQ on my 2013 goals blog post. Scratch my Sub 3:50 goal off my 2012 goals list! Next up? Ironman! congratulations! you fought through some tough miles there and I’m so happy to see you reach your goal!!! Congrats on the PR! Bart Yasso really knows his stuff! Can’t wait to hear about the rest of Ironman training! Congratulations! What a great way to start a year! Will be following your Ironman training. I’m a consistent “follower” too and love the blog. I even bought Insanity because of your posts and results (even though you were still doing P90x at the time, hey, insanity was cheaper!). Yesterday, (Sunday) I decided that I will start seriously training for my first triathlon. I am still deciding which one I will sign up for, but your post about your co-workers struck a nerve with me and somehow got me in gear to really stick to my goals. Thanks for showing us that 26.2 in 3:49:59 is possible!!! Congrats on running such a smart race and meeting your goal!!! hell yea, girl!!!!! im so happy for you! Fantastic job!!! Congrats on the PR!! 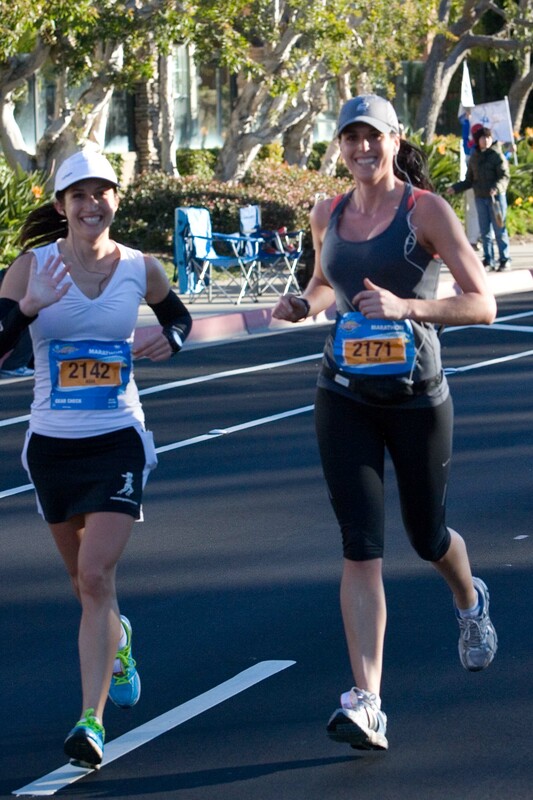 You are really inspiring me to run a full marathon! I’ve done 5 halfs (halves? 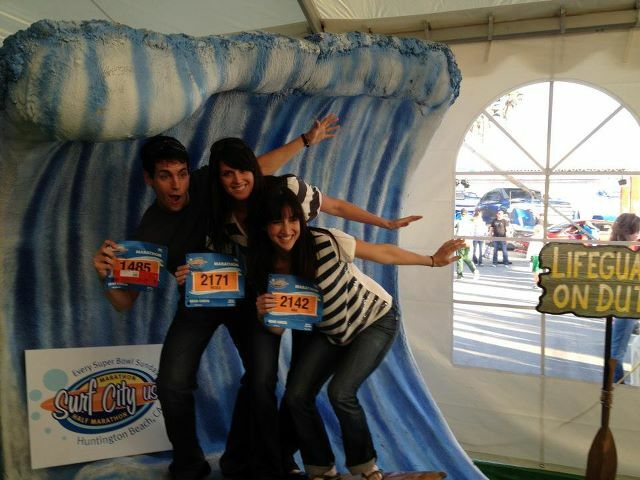 )and also got my PR of 1:59:10 at Surf City. Everytime I finish the half I wonder if I’d ever be able to run a full. 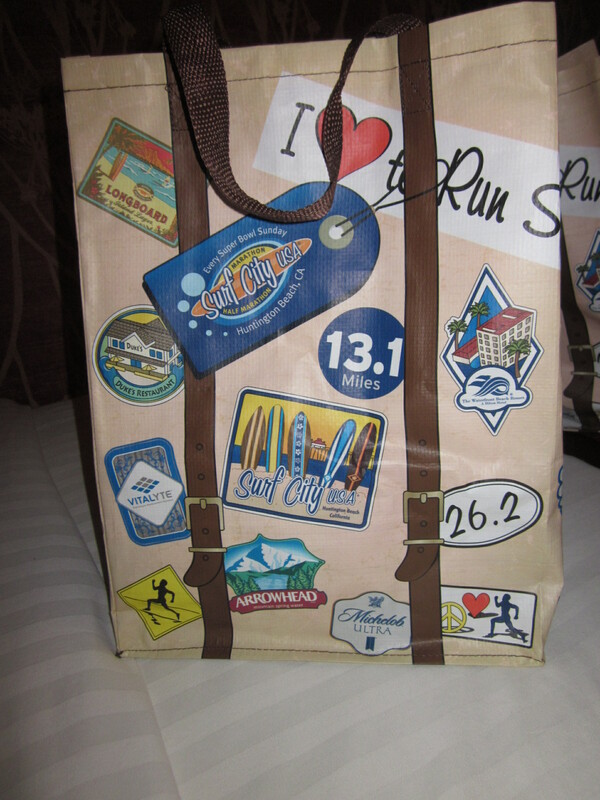 Reading your blog is very inspirational and I might make my 2012 goal to run and finish a full! Thanks for sharing your races and I’ve got to train with Yasso 800s. You should definitely do it!! I would recommend joining a running group if you don’t have one already. I did that for my first marathon and it was awesome – the 20 mile runs are practically “fun” when you have friends to run and chat with.